The strategies involved in sports betting are all about trying to get a better idea of the chances of each team winning or beating a spread than what the handicapper has. You won’t always find profitable opportunities in every single game, but when you do find them using systems like the one we describe here, you can get a real advantage. Most people have a general understanding that you’re not going to be able to beat the house in casino games and many other types of gambling like lotteries. However, there are some sectors where you can come out as a winner over time if you are good enough, and sports betting is one of those. It’s a bit different than the way that you can get an advantage in poker because you’re still betting against the numbers that the house has come up with instead of betting against other players. However, it’s a real chance for a real edge if you put the time in to develop your skill. In what follows, we’re going to give you the basic outline for creating a system to try to beat a sportsbook. The approach that we are going to outline here is about beating moneyline wagers. This can be pure moneyline bets where you’re choosing one team or another to win, or it can be a part of another wager like a points spread. The specific sport doesn’t matter, but the more obscure and less popular the game, the more likely the sportsbook is to make a mistake and the more opportunities you have to seize an advantage. You may see odds expressed in other ways at some online sportsbooks, but virtually all of them will list the odds with a moneyline as well. If you play at a site that uses another system, they’ll also provide instructions on how to convert that to moneyline terms if you ask support. First off, you have to understand what a moneyline is and how it works. A moneyline wager is described as a positive or negative number that looks something like -190 or +145. If the number is negative, that means the team for that bet is the favorite. With the example of -190, this means you’ll have to bet €190 to profit €100 on a win. Likewise, if the wager was with moneyline odds of +145, that means it’s for the underdog, and you could wager €100 to profit €145 in the case that team wins instead. Assume we have a game between France at +155 and England at -185. France is the underdog, and England is the favorite. For the bet on England (the favorite) to be profitable for the house, they need England’s true chances of winning to be less than 185/(185+100), which is 64.9 percent. For the bet on France (the underdog) to be profitable for the house, they need France’s true chances of winning to be less than 100/(100+155), which is 39.2 percent. This is the equivalent of saying they need England’s chanes of winning to be greater than 100 – 39.2, which is 60.8 percent. From these two results, the bookie is showing that their results gap is that England wins between 60.8 percent of the time and 64.9 percent of the time. If they’re right, then a bet on either England or France will be a losing proposition for the player, no matter which way they bet. The mathematics behind why the above works is a bit outside of the scope of this discussion of sports betting strategy. We want to keep the mathematics behind this as simple as possible, so you can just copy the above or make yourself a simple spreadsheet if you want to speed things along when determining the results gap of specific games or matches. After you determine the results gap, you’ll use various methods to try to estimate the true chance of the favorite winning. We’ll discuss those methods below. The basic idea, however, is to find match-ups and moneyline wagers where the favorite will either win at a rate greater than the top of the results gap or at a rate lower than the bottom of the results gap. To tie this into the example above, you would have a winning betting opportunity if England was winning more than 64.9 percent of the time by betting on the favorite (which is also England). However, you’d also have a winning betting opportunity of England was winning less than 60.8 percent of the time, and you’d realize that opportunity by betting on the underdog (France in this example). Finding the results gap is a pretty mechanical process, and if you practice it or set up a spreadsheet like we suggest above, then you’ll be able to do it very quickly without letting it slow you down. If all of the above with determining the results gap is setting the parameters of how the real game is played against an online sportsbook, then the actual action of the game is in trying to estimate the chances of each side winning. If you do this sufficiently better than the handicappers working for the sports betting establishment, then you will consistently find winning opportunities over time. If you do it worse than them, then you will lose. It’s no different than other skill-based games like poker where the best player will win in the long run. The only change is that, instead of playing cards, you’re trying to figure out how often a sports team will win. There are lots of different approaches for this, but almost all of them rely on looking at statistics of different players and team-against-team match-ups. The results of the past, especially the recent past, give you a lot of data that you can try to integrate into an overall chance of winning against another team. You’ll almost certainly need to make spreadsheets for this because of the sheer amount of data and number of calculations involved. It’s also helpful to do so because a single mistake in manual calculation or mistyped number into a calculator can mislead you into thinking you have a profitable opportunity when you actually don’t. If you want to really get into trying to beat the bookies, you have a legitimate chance to do so, but it takes a lot of work. 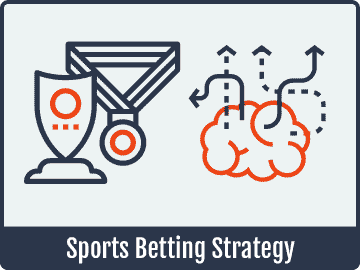 In the above, we’ve given you the basic framework for sports betting strategy and what you’re trying to aim at. We’ve described the way the game is actually played from an odds perspective against the house, which is completely different than how most people view sports betting. If you understand that, and you think that you want to give it a shot, then starting with a basic spreadsheet of statistics and trying to create your own models for win and loss percentages is the best way to go.